Join the Goddard House Team! Goddard House is managed by local, Massachusetts-based Senior Living Residences (SLR). SLR’s assisted living and memory support communities have been enriching the lives of seniors and their families for nearly three decades. SLR is acclaimed for our forward-thinking, pace-setting innovations in the world of senior care that include an enriching Olmsted Memory Support Program, the award-winning Brain Healthy Cooking Program and the stigma-shattering Dementia Friendly Communities Initiative that is quickly spreading across our area. We enjoy an exceptional reputation among families and professionals for providing top notch care, creating innovative programs that enhance quality of life for residents, and for maintaining the highest of industry standards. It is our associates’ commitment to our “Right Values” philosophy that established and maintains our position of excellence, respect and trustworthiness in the senior housing industry. Want an incredibly rewarding career? Join the Goddard team! Work alongside a team of caring and compassionate professionals. Enjoy an outstanding benefits package. Help make our residents’ twilight years their best years. Apply below! Click the position you are interested in to view more details and apply directly through our site! Senior Living Residences (SLR) is seeking a full time Wellness Nurse to support Goddard House, an Assisted Living and Compass Memory Support community in Brookline, MA. (Monday – Friday and every other weekend). We are proud of the environment we have cultivated that encourages all associates’ ideas and feedback in an effort to better our programming, operations and, of course, care for our residents. Goddard House assisted living community is seeking a full-time utility associate (Monday – Friday, 1pm-9pm). If you enjoy working with seniors, come and be part of the team that gives our amazing residents and their guests an enjoyable dining experience! SLR communities are guided by our core beliefs in resident quality of life, integrity, innovation, discovery and valued associates. We are proud of the environment we have cultivated that encourages all associates’ ideas and feedback in an effort to better our programming, operations and, of course, care for our residents. Responsibilities include dish washing, heavy cleaning of kitchen counters & storeroom, mopping floors, emptying trash, and other duties as assigned by supervisor. The utility person will work with volunteers, residents of the community and other staff members to complete tasks. Must be able to communicate clearly, listen to resident needs and work with both small and large groups. Have excellent problem-solving skills and a strong work ethic. Be able to lift 60 pounds and operate equipment safely. A desire to serve seniors and a dedication to improving their quality of life is required. Candidates must have reliable transportation. Background checks will be completed prior to employment. 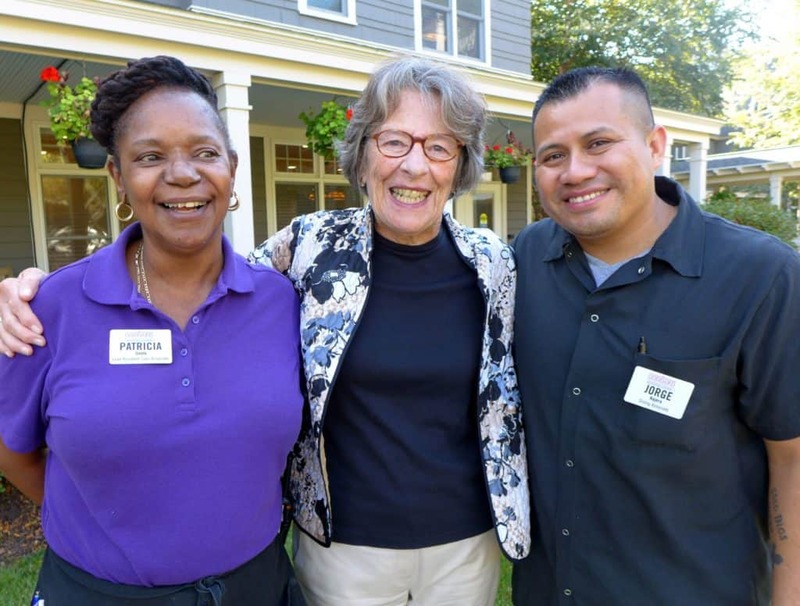 Goddard House embraces the aging experience for seniors living in the Boston area by operating a high-quality assisted living community and by creating innovative programs which support our need for purpose, engagement, autonomy and choice as we age. Goddard House assisted living community is seeking both full time and part time dining room servers to join our team. Full time shifts: Saturday-Wednesday, 6:30am-3pm. Part Time shifts: 4pm-7:30pm any available days. If you enjoy working with seniors, come and be part of the team that gives our amazing residents and their guests an enjoyable and delicious dining experience! Experience in a similar role is preferred as well as a flexible schedule, including availability to work evenings, weekends and holidays as needed are required. Candidates with ServSafe certification preferred. Goddard House is seeking a full time Lead Resident Care Associate to work in its Olmsted Memory Support Neighborhood. 40 hours per week 3-11pm and some weekends required. At our community, priority number one is the enhancement of each resident’s Quality of Life. We focus on the whole person, not just the treatment of their most basic physical or cognitive needs. Our method is to individualize a plan of care for each resident, providing just the right combination of services to optimize their overall well-being, independence, personal dignity and enrichment. Our Lead Resident Care Associates (CNAs or CHHAs) are responsible for the delivery of quality care to the residents of the community, encouraging independence and ensuring each resident’s physical, social, cultural, intellectual, and mental well being. Providing personal care as directed by the service plan and as scheduled on the RCA’s shift assignment in a compassionate, professional and efficient manner. Guide RCAs and assign coverage, if needed, to ensure floors are covered at all times. Assist with scheduling duties, as assigned. Assist the Concierge/Receptionist with phone/front desk coverage when needed. Monitoring residents’ SAMM making the required record entries to the Medication Management Record Book at appropriate times, and notifies the Supervisor concerning the effects of self-administered medications. Communicating with and assisting families and visitors in a helpful, professional manner. Assist the EnrichedLIFE Director and/or Compass Program Director by helping to plan and lead activity programming. Encouraging residents to socialize and participate in scheduled activities. Assisting with dining services as needed. Performing light housekeeping services as assigned and assists with cleaning of areas of bodily fluids and other emergencies. A desire to serve seniors and a dedication to improving their quality of life is required. RCAs must maintain a positive attitude, the flexibility to perform various duties in service to the residents and the ability to work in a team environment. Resident Care Associates must demonstrate experience in geriatric care, work well with seniors showing understanding and patience, be a flexible team player, and demonstrate a desire to work with individuals with Alzheimer’s disease or other related dementias. Goddard House is seeking a Resident Care Associate to work in its Olmsted Memory Support Neighborhood. 32 hours per week 3-11pm and some weekends required. Our Resident Care Associates (CNAs or CHHAs) are responsible for the delivery of quality care to the residents of the community, encouraging independence and ensuring each resident’s physical, social, cultural, intellectual, and mental well being. Initiating and completing activity programming as directed by the EnrichedLIFE Director and/or Compass Program Director. Goddard House is seeking Part Time Resident Care Associates to work in its Traditional Neighborhood. 3-9pm and some weekends. Goddard House is seeking Per Diem Resident Care Associates (11pm-7am). Walk-in applicants are welcome. Goddard House is seeking a full time housekeeping associate to join our team. Assist the Director of Building & Grounds with apartment turnovers. Handle service/maintenance calls from residents. Assist with general daily housekeeping. Perform ongoing and preventive maintenance tasks. Keep exterior grounds clean and free of debris, and perform light grounds care. Handle snow removal and salts and/or sands on walkways, sidewalks and entryways, as assigned. Assist with moving furniture and trash removal, as assigned. Assist with Model Apartment set-up for touring. Provide support to various department directors on community special events, holidays and marketing functions. Goddard House is seeking a professional to serve as Full Time Programming Assistant for our memory support community Tuesday through Saturday – 10:30am – 7pm. We are looking for a dynamic, innovative programmer who is creative, friendly, energetic and organized to assist the Program Director in creating, scheduling and implementing programs for our assisted living residents, as well as for residents in our Compass neighborhood who are living with dementia. The Programming Assistant provides assistance in managing a comprehensive program for active independent seniors, as well as individuals with memory impairments, with the goal of enhancing their social, intellectual, creative, spiritual and physical well­ being. As assigned, instructs and supervises other assistants, Resident Care Associates (RCAs) and volunteers in their participation in activity programming; and serves as a liaison with family members, the larger community and care providers. The Programming Assistant may assist with developing, scheduling and directing these programs daily, including driving residents to off-site activities in the community van. Duties also include providing support for photography, the creation of a monthly newsletter, updating the community Facebook page, and assisting with public relations efforts. 1 to 2 years experience working with the elderly and/or Alzheimer’s populations. Experience providing programs or services to the elderly. Must be responsible, organized, and dependable with the ability to communicate effectively with senior citizens and their families. Must be flexible and a good team player. Must have patience, tact, cheerful disposition and enthusiasm. Must be able to express self clearly, verbally and in writing. Must have a history of responsible, accident-free driving.